In recent years, a model of innovation has emerged in the developing world where they find their own solutions to their problems, turning necessity into a virtue. Cheap technologies and designs that triumph in their countries of origin are exported to the developed world thanks to their efficiency and simplicity. Daiub Esteban Odón.A system to detect rotavirus in the feces of babies by using a chip implanted in diapers has been developed in India. In the early 1990s, Dr. Therdchai Jivacate began working on a revolutionary idea: providing prostheses to citizens of Thailand at reasonable prices. The key to this story probably lies in the concept of “reasonable”. Is it reasonable to ask for up to $20,000 for a prosthetic leg in a country in which people earn $2 a day? Therdchai Jivacate thought it was reasonable for a Thai farmer to pay $30 for a prosthesis, and thanks to his innovative spirit he converted a smart idea into reality. Starting from bottles of drinkable yogurt, his foundation molds orthopedic legs and feet that make life easier for thousands of people. The solution is cheap, but not on the cheap. “Although it may sound counterintuitive, the quality demanded by poor people tends to be higher than the quality demanded by the rich,” says Vijay Govindarajan, one of the men who knows best about investing in innovation in developing countries. The inhabitants of the rural areas of Thailand do not need prosthetics to walk on the sidewalks of a large western city, but rather to get into the rice fields, transport goods by bicycle or climb trees. This is why orthopedics should be more durable, stronger and more manageable. “It’s about squeezing the performance paradigm, offering more for less,” sums up Govindarajan, creator of the term “reverse innovation” which defines these bursts of ingenuity that arise where the need intensifies, in Southeast Asian countries, in Africa or Latin America, and whose achievements can be exported to the first world. Today, while some of the victims of the Boston Marathon attack suffer all kinds of hardship to pay for prostheses, the victims of land mines in Laos, Myanmar, Malaysia and Thailand have solutions that fit both their legs and their pocketbooks. Govindarajan began developing this term when he discovered that many of the sophisticated Western inventions did not reach developing countries due to their high cost and complex operation. In the years in which he led the innovation department of General Motors, the U.S. giant developed a device that performs electrocardiograms and only costs $500, compared to the $10,000 price of those found in hospitals in Europe or the U.S. Moreover, its simple operation does not require the use of a specialized technician who also takes care of maintenance. It was developed with the needs of India or Africa in mind, but they have been sold by the thousands in 125 countries. Now, it is the innovators of the poorest regions of the world who are designing their own technological solutions for a pittance, perfectly tailored to their needs and exportable to the developed world thanks to their efficiency. “Because of the low per capita incomes in the developing world, conditions are ripe for innovations that offer decent quality at an ultra low price, i.e. a 50% solution at a cost of 5%. At first, a 50% solution is unattractive in the rich world, but over time the efficiency rises until, finally, it is also attractive,” writes Govindarajan. The examples have begun appearing like mushrooms after rain, such as the SMS-based telemedicine systems developed in Africa that are beginning to be studied in the U.S. for their efficiency and savings. In India, diapers are already being used containing a smart chip that diagnoses deadly diseases by contact with the feces of infants. Recently, the invention of Argentine Jorge Odon that helps with complicated births is gaining advocates, and everything indicates that harmful forceps will be retired forever. “The Odon device, whose development has the support of the WHO and which is currently at the stage of clinical trials, offers a simple and low cost way to assist in births and protect women in labor when the delivery is prolonged,” said Margaret Chan, director general of the World Health Organization (WHO). Reverse innovation, born among the poor and dazzling to the rich, has begun to find its place in the world thanks to the talent to turn a lack of resources into a virtue. And one of the key objectives is, obviously, health care: better to invent a new method than to adapt one brought in from the outside. “In general, efforts to design new technologies in low-resource places have been more successful than attempts to adapt existing technologies by eliminating more costly or complex features,” expound the bioengineers Rebecca Richards- Kortum and Maria Oden recently in the prestigious journal Science. These researchers at Rice University in Houston concluded, after a couple of weeks in Africa studying their health systems, that it is best to promote innovation in these countries to provide solutions to their problems. Going a little beyond the classic “teach to fish rather than give a fish”, Richards- Kortum and Oden designed a program that provides tools and knowledge for innovation in health in low-resource settings where the design enters into conflict with shortages of electricity and drinking water, scarcity of funds, lack of supplies, absence of trained users and insufficient policy innovation. 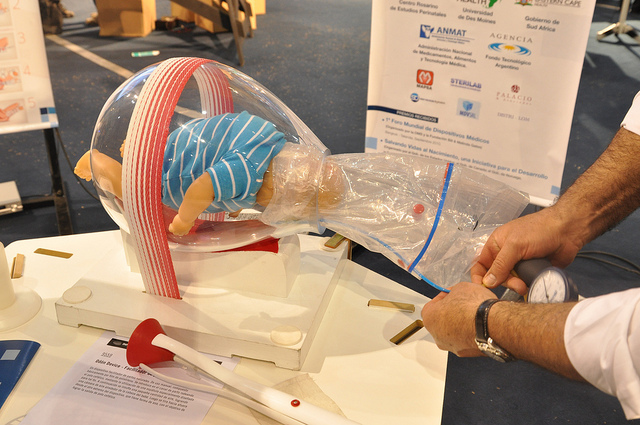 For example, thanks to a breathing apparatus for the resuscitation of newborns, which operates manually, is self-inflating and does not need electricity, the mortality of infants in Tanzania has been reduced by 47%. In collaboration with the University of Malawi, a device for the treatment of respiratory problems has been developed which costs $400 and provides the same care as machines which cost up to $6,000 in the U.S., fifteen times more. Less expensive but no less efficient: Richards-Kortum and Oden say that after a year of clinical evaluation of five machines installed at a hospital in Malawi, not one of them has failed. Normally, in these countries 40% of the breathing devices break down because they are designed to work with stable electrical current flows and not with the unpredictable supply peaks that occur in some parts of Africa. As well, Africa has begin to develop devices to detect the presence of HIV which are just about able to meet all WHO recommendations: cheap (less than five dollars), user friendly (requiring hardly any prior training), fast and robust (results in less than an hour, no special temperature requirements for transport or storage), and that work without the need to connect to the electric grid. These initiatives are reminiscent of many of the projects that the Bill and Melinda Gates Foundation is funding for a new generation of cheap, unbreakable and sensitive condoms or to efficiently dispose of organic waste of human origin in populations without sanitation or sewage systems. But it’s not enough: “Alternative approaches are needed to design technologies intended to operate in areas without resources for consumption,” say these bioengineers.